The other day we told you of Chickenfoot's roof-raising performance at the Fillmore at Irving Plaza in New York City. MusicRadar was on the scene, and we decided to check out the band's gear and get a little inside scoop on the backstage goings on. 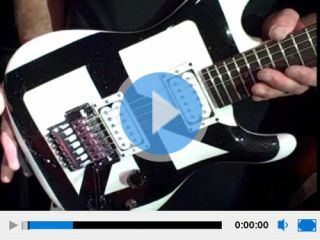 In the video below, Michael Manning, Joe Satriani's longtime guitar tech, gives us an up-close-and-personal guided tour of Satch's main Ibanez JS guitars, emblazoned with graphics such as the Chickenfoot logo and some of Satriani's own unique doodlings. After chatting with Manning, MusicRadar paid a visit to Satriani himself, who was chilling backstage before soundcheck. It was the next-to-last date of Chickenfoot's hugely successful "road test" of shows before they hit Europe and return to the States to play bigger venues in the late summer and fall. As you can see in the video below, Satriani was his usual super-serious self. Not! Check back with MusicRadar tomorrow for complete video tours of bassist Michael Anthony's stage setup and Chad Smith's ultra-cool drumset.